From 1992 to 2001, AZG members went on Mountains and Rivers Retreat for sesshin to Big Flat. These retreats were seminal to AZG practice-as-it-was. 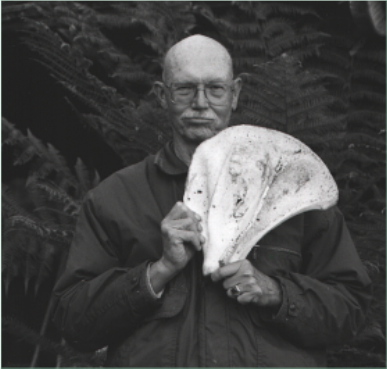 Bill Devall evokes the essence of Big Flat for those of us who did not go, and those of us who did. Between the mouth of the Mattole River and the Shelter Cove subdivision lies the King Range National Conservation Area. Administered by the BLM, most of the King Range consists of wild mountains and beaches. Until the 1960s a few ranchers had leases from the BLM to run sheep on the meadows along the coast. A few inholdings of private property, mostly 160 acre parcels, were the sites for small cabins used by the sheep ranchers. The largest homestead was at Big Flat, at the mouth of Big Flat creek, which had its headwaters on King Peak, the highest coastal peak along the coast of California. During late 1960s, some of the private inholdings were sold. Two surfers bought part of the homestead at Big Flat which included the house and barn of the homestead and landing rights to a gravel landing strip that had been built during World War II for military aircraft protecting the coastline from possible Japanese invasion. The point at Big Flat was known for south breaking swells. The two surfers flew in some of their surfer buddies who had construction skills and began rebuilding the house and barn. They built a hot tub and deck and a standing wave. The wave was built with mortar and rocks the surfers brought up from the beach. When the surf was up, all work stopped and the surfers rode the waves. After surfing and some construction work there was always food and beer around the campfire. Besides the surfers, the only people who cruised through the Flat were people on ATVs who came across the mountains on old logging roads, some hunters during deer season, and a few people who had heard about backpacking the Lost Coast. Because of the prevailing northwest winds, most of the backpackers started at the north end of the Lost Coast, at the mouth of the Mattole River, and hiked south to Shelter Cove. Bill knew one of the surfers, and during summers he would fly down to the Flat, hang out and sometimes help in the garden that the surfers were developing with vegetables. The surfers lived much like the homesteaders must have lived, but with flush toilets and cold beer. After the house and barn were completed, the two surfers who owned the place decided to spend more time surfing overseas, especially in Indonesia. The AZG had permission to use the facilities one week a year for Mountains and Rivers sesshin. 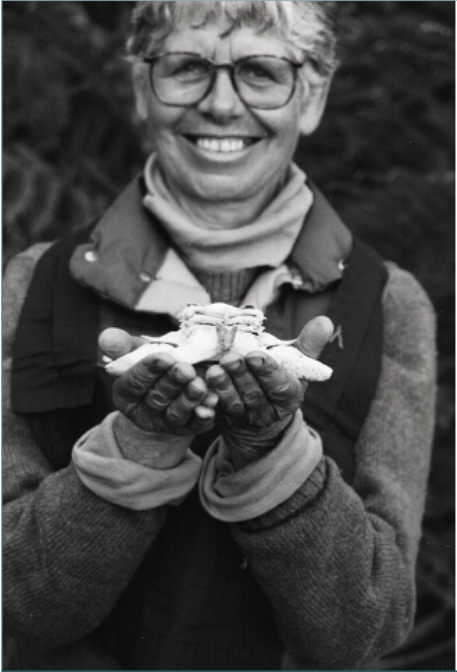 When Maylie began coming to Arcata to be the teacher, in 1989, the AZG began having annual sesshins in the outdoors. Sometimes the AZG held its retreat at a place near Willow Creek. One time it held a winter sesshin on the Klamath River. One time the backbacking sessshin was held in the Russian Peaks wilderness. When the opportunity arose to use the house and barn at Big Flat, the AZG jumped at the proposal. 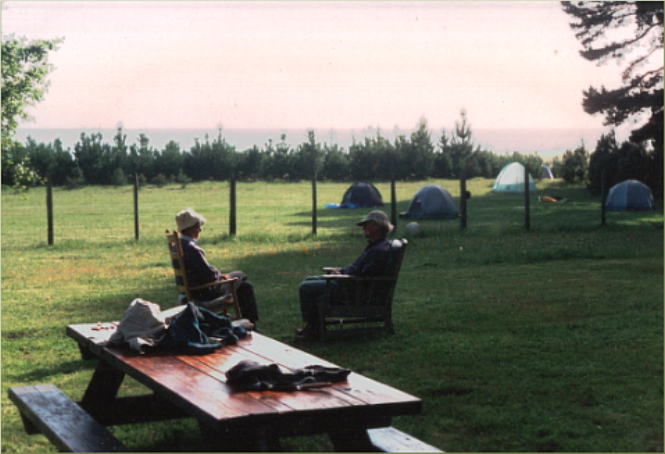 Participants hiked from Shelter Cove to the Flat where we camped in a meadow inside the fenced compound. Bill knew a pilot who flew him into the Flat landing field with the food and supplies for all participants in the sesshin. Sesshins began on Thursday and ended on Monday. 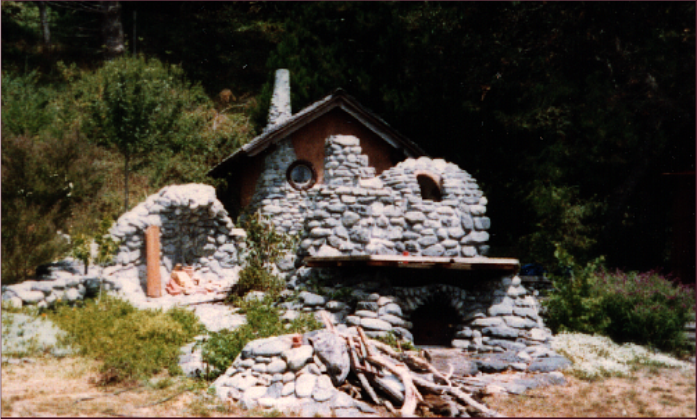 Bill was the firemaster of each sesshin, keeping the fire under the hot tub, the campfire, and the shower as well as the propane kitchen stove. Each sesshin had different dynamics of human relationships and humans’ relationships with non-human sentient beings. Does a lawnmower have Buddha nature? Certainly lawnmowers have personalities ~ contrarian personalities. The lawnmower at Big Flat especially has a contrarian personality. All who use the lawnmower first bow to the lawnmower, take a deep breath, and pray. Buddhists are not supposed to pray, but anyone who has used the lawnmower at Big Flat knows that unless you pray and unless you have complete Faith and complete Hope, you will be eaten by the lawnmower. Preparations for the sesshin began with menus for meals and instructions to the cooks. Sesshin coordinators were responsible for menus, shopping lists and packaging food. Mark and Suzanne did much of this. They adapted some menu ideas as basic procedures from Ring of Bone's mountains and rivers sesshins. 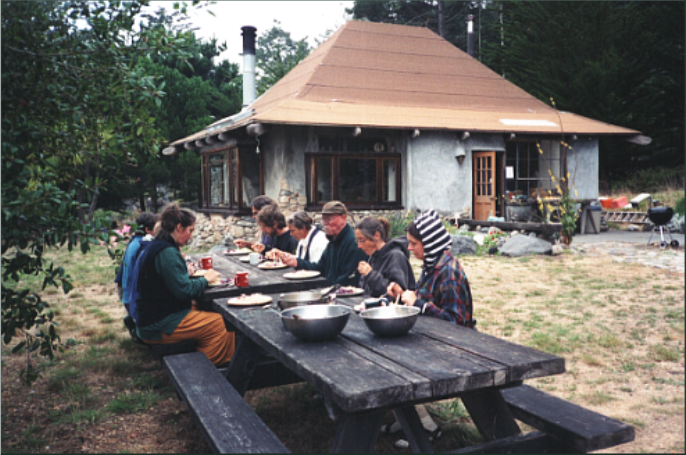 The meal practice was essential to furthering practice during sesshin. On the day beginning sesshin, participants carpooled to Shelter Cove. The walkers started at Black Sands Beach, walking north. Maylie asked that walkers start kinhin in silence, but conversations occurred during rest breaks. The first stop was Horse Creek. Each creek has its own rhythm. The second stop was Gitchell Creek, a lunch break. The next stop was Buck Creek and the fourth stop at the mouth of Shipman Creek. From Shipman Creek to Big Flat the beach is very narrow. Walkers had to watch for incoming waves. Even at low tide people can be swept to sea if it is a heavy surf day. Maylie gave walkers handouts including readings that she would use in her dharma talks at the Flat. the colors of the mountain are all the Pure Body. but how to tell people the next day? Do you walk with a question? What are your experiences of walking? How do you experience the generosity of valley stream, ocean and mountain? Do you need a question? The bellringer roused participants at 6am. First sit was at 6:30. Breakfast was at 8am. Maylie asked that participants remain silent during the sesshin. Discussions were held during the evening, after supper. After more zazen, Maylie gave a dharma talk and discussion between 11am and noon. She frequently chose passages from Dogen’s Mountains and Rivers Sutra. During the afternoon Maylie held dokusan under the branches of a tree. The student and Maylie faced each other sitting on chairs. Each student had at least a half hour each day with Maylie if they wanted to talk with her about their practice. After supper there was story time, when someone, usually Bill, told stories about the Flat. A tradition, started by the surfers, was becoming a Flathead. A Flathead had to walk into Big Flat at least once, not ride in on an plane, had to drink beer while sitting naked in the hot tub, had to run naked into the surf, and had to tell an interesting story around the campfire, a story that people would remember. Bill told one of the stories about the naked surfer in high heels at the Flat. The last zazen ended at 9pm and participants could sit in the hot tub or go to bed. The last evening of the sesshin, after supper, we had a group discussion around the campfire. Dogen said fire is fire and ashes are ashes. He didn’t say anything about smoke and shifting wind. Maylie facilitated the discussion. What activities would engage the AZG during the coming year? Maylie was interested in engaged Buddhism, work in prisons, peace work. People listened to Maylie. She was our teacher. 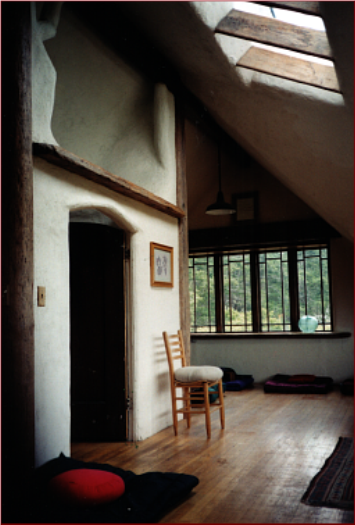 On the last day of the sesshin we had early zazen, had breakfast, packed our gear. 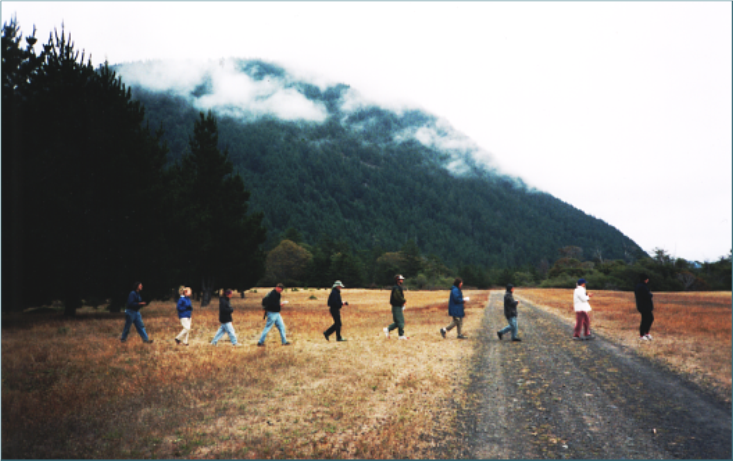 The hikers began in silent kinhin, walking south across Big Flat Creek and along the beach. The walking was informal. Some hikers stopped for snacks at each creek mouth. From the mouth of Horse Creek the hiking was more strenuous across the shifting sands of Black Sands Beach to Telegraph Creek and the parking area where the vehicles awaited us. Driving to Arcata was three hours. The participants gathered at a Mexican restaurant in Arcata, drank beer, ate and told stories. The next morning Maylie returned to Berkeley on the bus. Each sesshin had a crisis and resolution. These happened. They were spontaneous. One year a young woman who practiced in the Bay Area and was a forest activist, brought in her backpack a small redwood tree that she wanted to plant at the Flat. Bill pointed out that the redwood tree was unlikely to survive because of the long drought months on the Flat. The young woman was upset and began crying. What to do with the young woman and with the small redwood tree? We could just plant it and hoped that it survived. In this situation Maylie used teachings of wise action. Discussions where held. The swallows were building their nests under the eves of the barn during the discussions. Their constant chatter was more pleasant than the conversations between humans. Some people said just plant the tree and get back to zazen. Other people said we had to have consensus on right action. Maylie guided the discussion. It was decided to take the small redwood tree back to Arcata and plant it under the protection of large redwood trees in the Arcata Community Forest. A guerrilla tree planting ceremony was held in the Forest. People offered poems and readings blessing the small redwood tree planted near a small stream in the Forest. One sesshin was the rattlesnake sesshin. A twelve inch rattlesnake lived under the barn feeding on rodents. When the morning sun hit the rocks along the stairs on the sunny side of the barn, the rattlesnake would come out and curl up on a rock by the stairs. Some of the participants in the sesshin were terrified by the rattlesnake. We walked by the snake each time we left the barn to walk kinhin in the meadow or go to meals in the house. Our teacher, Maylie, told us to walk quietly, breathing in and breathing out. The rattlesnake was full of rodents. There was no need to attack any of us unless someone moved within strike range. Dwelling with the rattlesnake helped us to experience the present moment without delusion. When we arrived at the Flat, all was quiet. The mice were under the barn. Sunshine and warm weather. People settled into their tents. Zazen began after supper. Returning to their tents some people discovered that they had been raided. Was it raccoons stealing snacks? Was it mice? No. In the darkness campers heard the sounds. Bears were active. During the morning hours people saw three bears, a mother and her two cubs. What relationship should we have with the bears? They were eating the compost from our meals. How to make a decision. Maylie called a council. Some people wanted to keep the compost in the house. However some said that bears break windows and invade the kitchen. A consensus was reached. The compost would be taken outside the compound and about a mile down the Flat. The bears could eat and the Buddhists would eat. The bears appeared each day, but they were ignored by the Buddhists. The bears walked through the compound. The people during kinhin walked through the compound. Humans and bears were interacting in the way that accommodated the needs of different beings. Humans who had fear of bears moved their sleeping bags into the house. Sentient beings continued their practice. The bulb sends forth a single stalk, no leaves, and a bright pink flower emerges. The common name of this plant is naked lady. It is not a native plant on the Lost Coast. Some bulbs were planted by someone inside the compound at Big Flat. One year when we arrived they were in full bloom. There were more women than men attending the sesshin. One younger man from Arcata attended the sesshin. He had not attended any other sesshin and never attended zazen with the AZG after this sesshin. He liked to take hot tub with the ladies. Bill as firekeeper usually had the hot tub warmed to comfortable temperature by the end of work practice period. Maylie preferred that people sit zazen after work practice. Some people preferred to sit in the hot tub. At night people sat in the hot tub and talked. Maylie asked that we be silent. The teaching was from the Bluecliff Record. 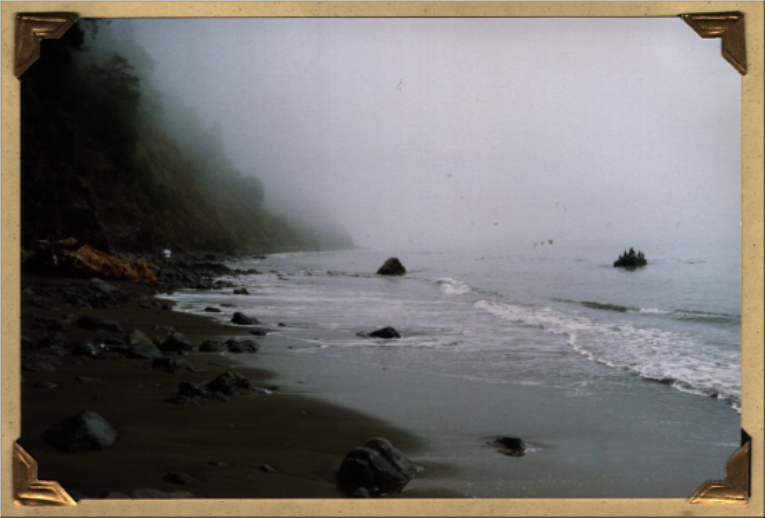 During the late afternoon, Bill sat zazen with his back against a driftwood log on the beach. A lone surfer crawled out of his driftwood hut and asked what was going on up at the house. “A Buddhist sesshin,” Bill said. “What is that,” the surfer asked. “Sometimes people sit on the floor in the barn. Sometimes people sit in the hot tub,” Bill replied. “What are the waves like today?” Bill asked. “I’m going back into the water. I can get some rides out of this,” the surfer said. He got into his wetsuit and launched into the incoming waves. Bill watched him catch several good rides. Return to silence. Walk through the wet grass in the meadow back to the house. Help prepare supper. Darkness arrived. The naked ladies began chatting in the hot tub. Warm night at the Flat. The bell rang for the last zazen period of the day. The surfer curled up in his sleeping bag in the driftwood hut. May died May 10, 2001, five weeks after she was diagnosed with cancer. Pete had built a wooden coffin for her body. After she died, Rose washed her body and placed it in the coffin. Pete and others carried her coffin into Rin Shin-ji temple. People who knew Maylie were phoned and arrived at the temple. Each person who wanted to speak to her arose and spoke and scattered flower petals on her body. Her body was transported to the crematorium at the cemetery in Eureka. A memorial service was held while her body was cremated. People who knew her spoke, including pastors and friends who were not members of AZG. One friend of Maylie's rose and said that members of the AZG were fools who would never be good Buddhists. The woman almost ran over Suzanne, Mark, and Bill as they were standing in the driveway of the cemetery. She drove her huge SUV out of the cemetery and never spoke with members of the AZG again. The sangha decided to scatter some of Maylie’s ashes on the beach at Big Flat. People hiked to the Flat from Shelter Cove. Bill flew into the Flat. Dark clouds covered the Flat. During sesshin and kinhin people experienced their own sense of loss. Gordy planted a memorial rose in a wooden arbor. Maylie’s ashes were carried to the beach. Each person in the circle spoke of their practice and how Maylie influenced their practice. Candles were lit. Each person in the circle took some of Maylie’s ashes and scattered them in the surf. It was done. People who hiked to the Flat packed their backpacks and silently walked back to Shelter Cove. Bill waited on the beach for the plane to arrive to take the garbage and Bill back to Garberville. Low clouds dropped across the Flat. Bill sat with his back against a large log on the beach waiting for the plane. He experienced pain and despair. He wanted to leave that place. The tide was rising, carrying Maylie’s ashes out to sea. Bill was cold and tired. In the distance he could hear the engine of the plane before he could see the plane dropping through the clouds. The plane landed, garbage and Bill were loaded. The pilot said he had to get out of there fast before the cloud level dropped. As he guided the plane across King Peak, the clouds dropped away and bright sunshine covered the mountains and over Garberville. The AZG never returned to Big Flat. 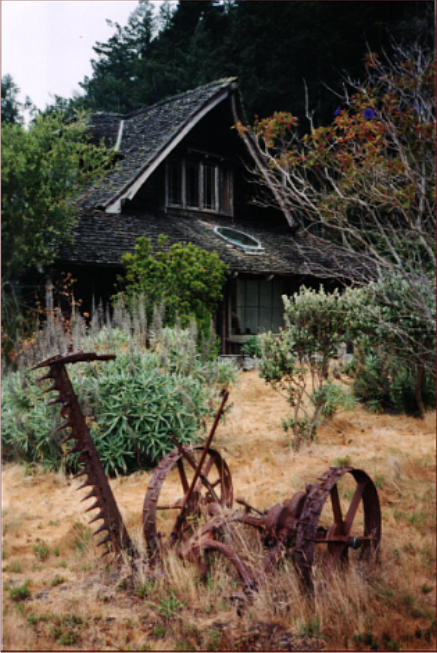 Years later a wildfire burned the ridge about the Flat but the house and barn did not burn. The hot tub burned. A surfer sprayed water on the roof of the barn and it did not burn. After the wildfire the deer and bears and rattlesnakes returned. Surfers reemerged, carrying their surfboards on their backs, drawn to the south breaking waves at the point. The AZG changed. The AZG elders were sent to practice in the forest. New members of AZG wanted to focus on the war in Iraq. The wildness of all sentient beings was considered non-Buddhists in the American justice tradition. Some said that the sesshins at Big Flat never happened. The sesshins were collective delusion. Some said that the strength of practice at AZG was born out of the campfires at Big Flat. Those who participated in the sesshins at Big Flat know what happened. The clouds know what happened. The surf knows and the huge driftwood logs know that some humans rested their backs against the logs and sat in zazen. Breath out, breath in with the rhythm of the waves.